In an Unforeseen Pinch? Use Zip Ties! Posted by ziptieguy on September 17, 2012 · Comments Off on In an Unforeseen Pinch? Use Zip Ties! How many times have we all been there? We’re driving down the road and our hub cap falls off … OK, hopefully not MANY of you have ever been in that scenario. That might be a bit too dangerous for our tastes, but when we came across this picture from Chicane Culture, we were inspired. 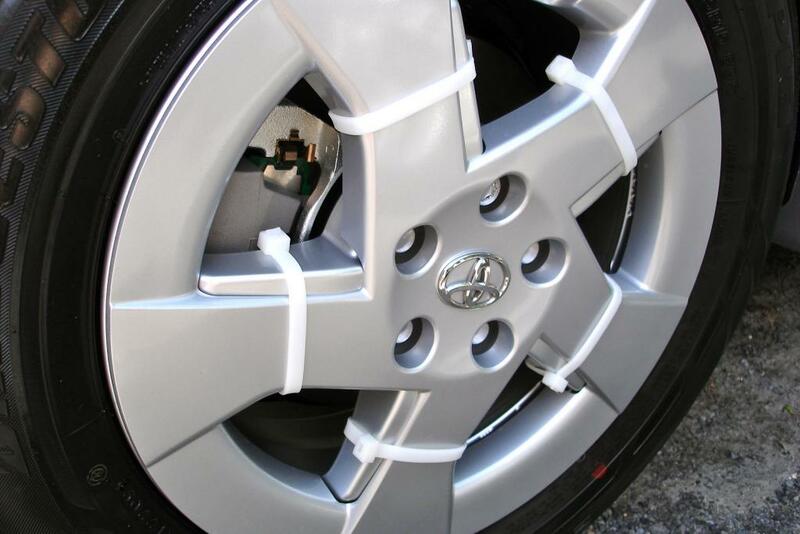 For years, Duct Tape has been listed as the go-to repairing material, fit for any and everything from automotive needs to dresses repair and even homemade bandages! And those are all great, and inspiring MacGyver-esque uses, but why limit ourselves? As the picture shows, having a couple of useful zip ties around may be the difference between life … OR DEATH! … Or at least a shaking hub cap. So we did a little brainstorming this morning to come up with some other ideas of how you could use items like zip ties, releasable cable ties, and twist ties in your every day life to solve an unforeseen problem. As an editor’s note, we haven’t actually TRIED all of these yet, so we can’t vouch for their success or their safety. This is more so just a way to have some fun in thinking about different ways ties could be used. Here are ours, but we’d love to hear yours as well! Belt too short? Can’t get to the store for a new one? In comes a releasable cable tie to the rescue! Connect through the buckle and a hole on the other end for a temporary fix.